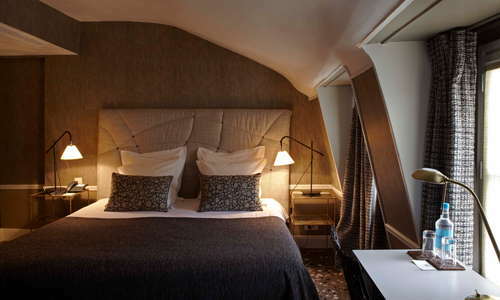 Let’s face it, Paris hotel rooms are small. 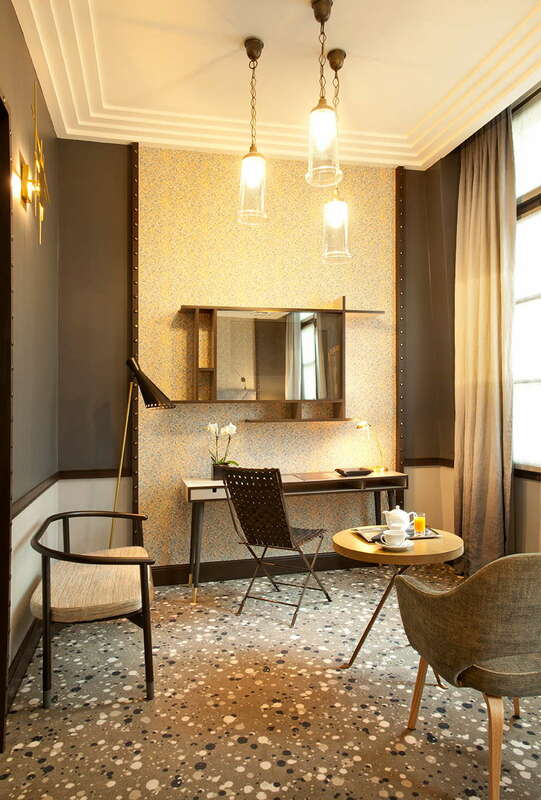 At Hôtel Thérèse, they’ve gone the extra mile to turn compact spaces into luxe and cozy oasis that feel comfortably snug rather than cramped. Gracious service adds to that pampered feeling and the hotel’s location in the heart of Paris, near the splendid Palais-Royal gardens, adds to that feeling of having found a diminutive but luxurious oasis. 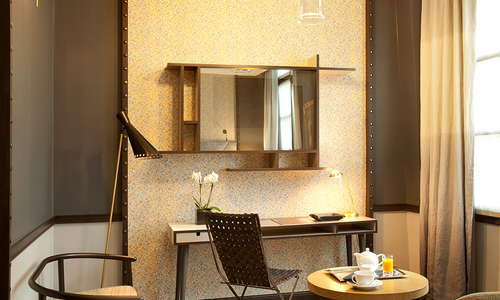 YOU SHOULD KNOW Though there are in-room coffee machines in deluxe rooms only, tea is provided in all rooms. 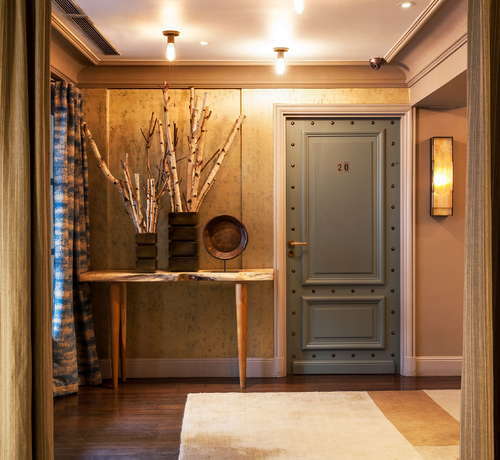 Though rooms are small, the quality of the furnishings, lighting, and fabrics (by the famous Parisian designers Rubelli and Pierre Frey) is of an unusually high quality. 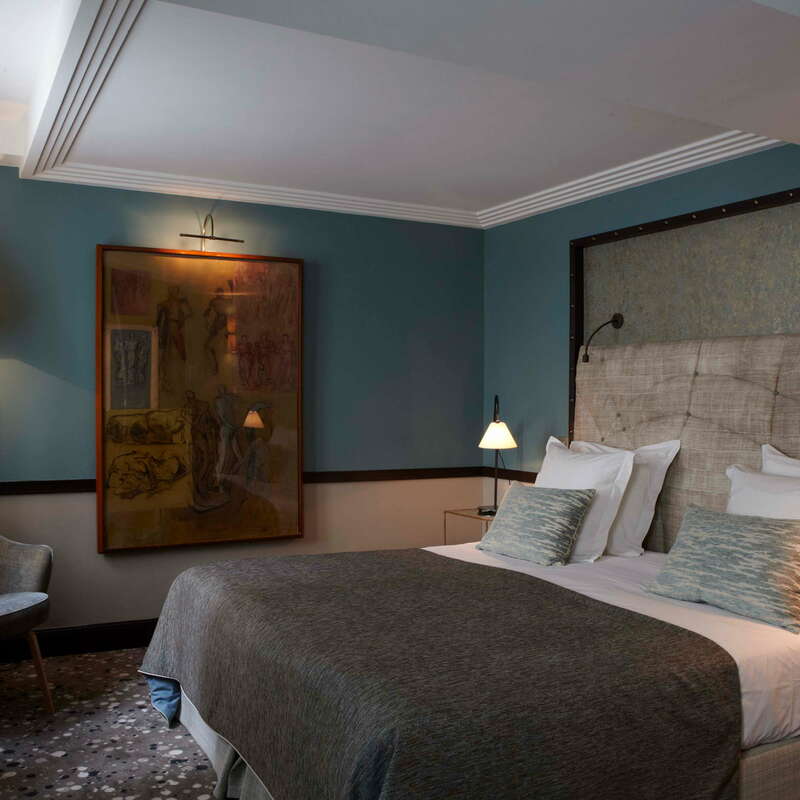 Tasteful artworks, or romantic wallpapers, chic mirrors, and elegant woodwork, all in warm, saturated tones, add the finishing touches. 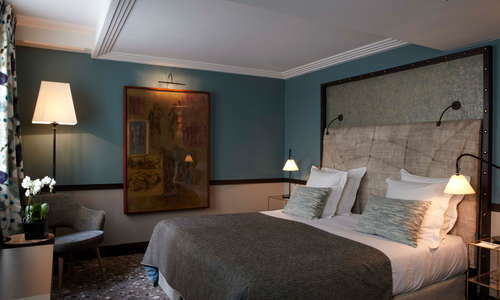 Deluxe rooms offer a small velvet-clad lounge. Cozy marble bathrooms have either a walk-in rain shower or tub with hand-held shower, with limited shelf space. Luxe bath products are from Fragonard. 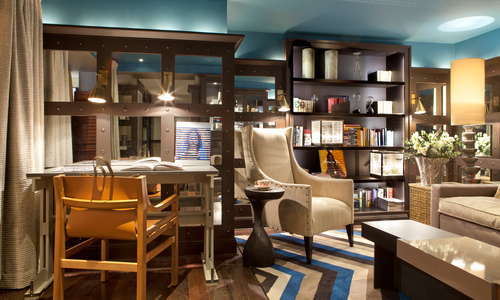 The chic lobby-lounge has plenty of comfy chairs for relaxing with a complementary newspaper or magazine. 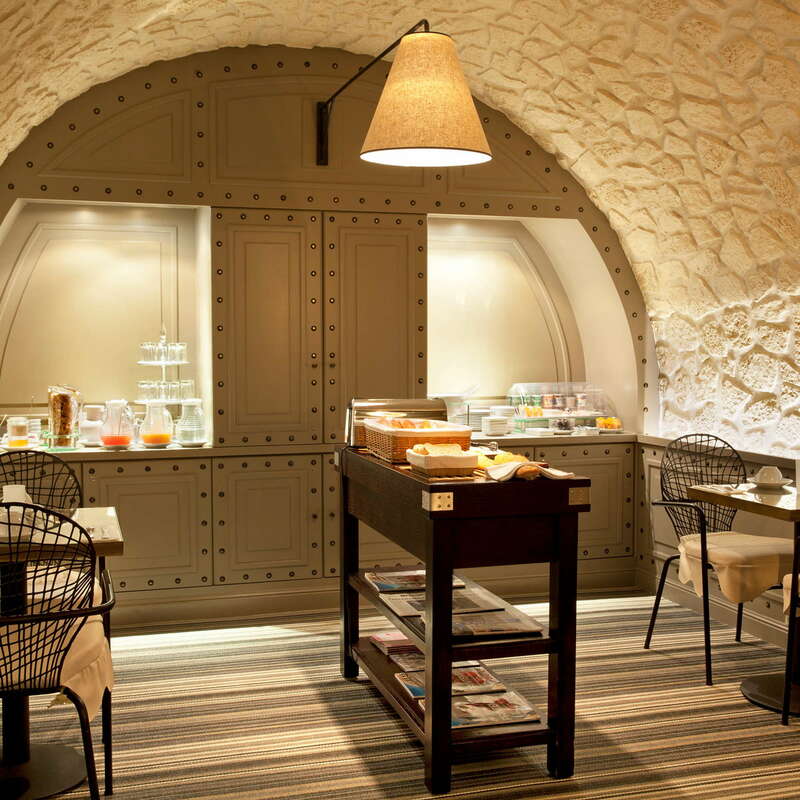 A classic buffet breakfast—fruit, pastry, charcuterie and cheese—is served in your room or the charming cellar lounge. There is no in-hotel restaurant, but the hotel serves a complimentary tea time from 4 p.m. to 6 p.m. and the hotel will order in meals at your request. Nearby rue Sainte-Anne is Paris’s little Japan, with scores of Japanese restaurants of all types. 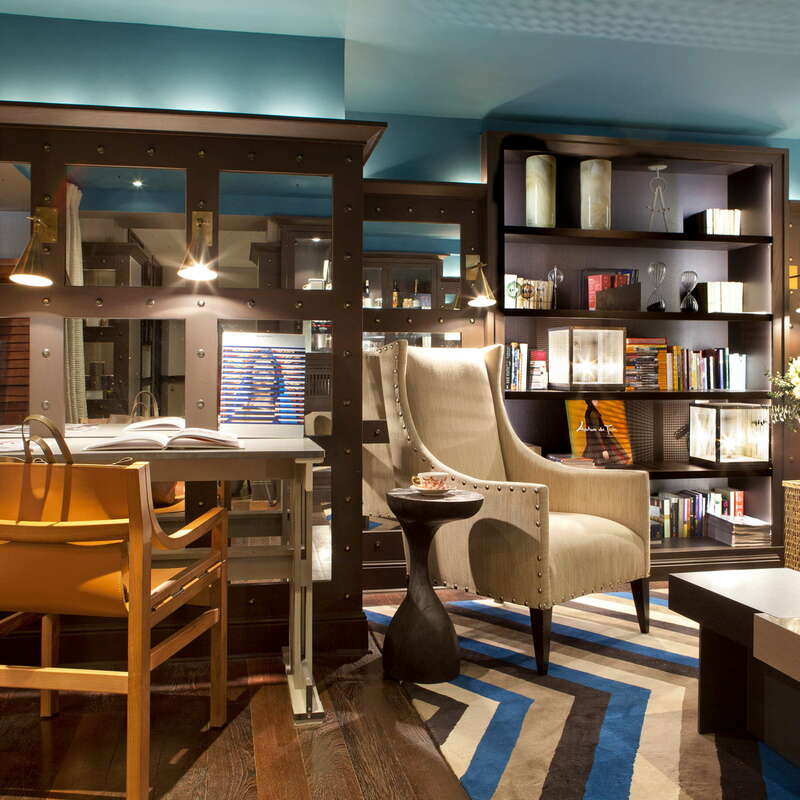 Relax in the lounge with a drink from the honor bar. Just minutes away, behind the Palais-Royal and off the rue des Petits Champs, Galerie Vivienne, Paris’s loveliest covered “passage” still retains its early 19th-century elegance, not to mention some lovely boutiques and the wine store Legrand et Fils, a good place for wine tastings. A few minutes walk to Palais-Royal-Musée du Louvre station, where you can get line no. 1, Paris’s most central line. 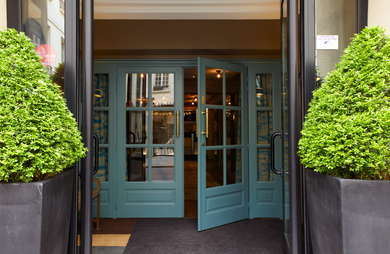 The hotel is set on a small, quiet street just steps from upscale shopping and historic addresses of the glorious Palais-Royal. 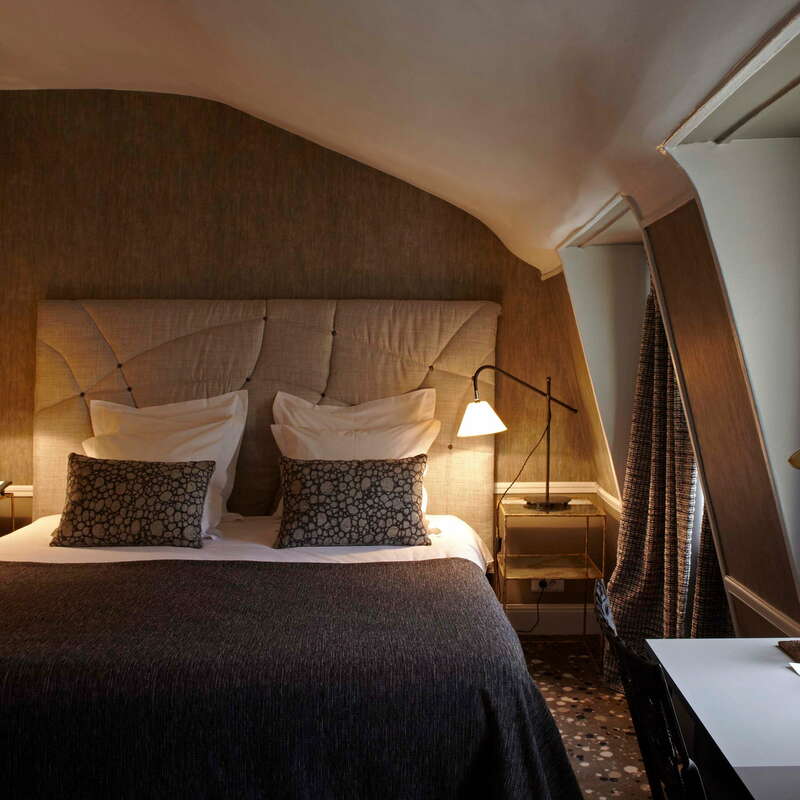 Only minutes from the Louvre and Les Arts Décoratifs (the wonderful decorative arts museum)—not to mention, the islands of the Seine, Notre-Dame, and Saint-Germain—there are multitudes of excellent restaurants, cafés, and wine bars just minutes away. A few blocks away, tiny rue de Nil is home to the Frenchie empire, a favorite among foodies, with Frenchie restaurant, wine bar and Frenchie to Go, open for a yummy breakfast, lunch, and all-day snacking. 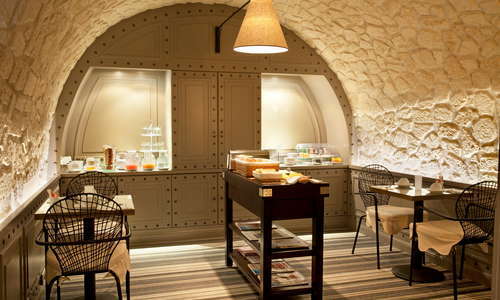 Coffee lovers do not miss l’Arbre à Café, one of the city’s top coffee shops. Frenchie Wine Bar has Paris's best selection of natural wines by the glass. Silencio bar is David Lynch's oh-so-chic private club, serving some of the city's best cocktails, open to non-members at midnight. This peaceful, cozy, and beautifully designed haven is a lovely place to relax and refuel after a strenuous day of sightseeing.